Birthday Specials ~ 15% off any service of choice during your birthday month. Referral Discount ~ refer a friend and receive 15% off your next service. Like "SERENITY SKIN CARE" on Facebook to see specials that we run from time to time during the month. MONTHLY SPECIAL for a FREE service: At the end of each month we do a drawing of all clients who have came in for services that month and one person wins a full service...for example "European Facial". 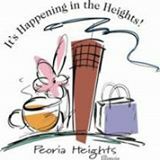 Serenity Skin Care is a proud member of ​​Peoria Heights Chamber of Commerce. Our address is Prospect but we face Duryea Ave. We are located between the restaurant Seven and Carlson Jewelers. Please call for directions. Treat your loved one to a relaxing & pampering treatment.